We may still be a couple years from the first fully automated, self-driving car. But in the meantime, Germany’s Düsseldorf Airport has hired a valet robot to do your driving for you – or, at least, park for you. 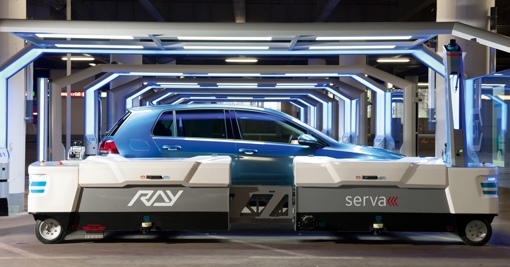 The automated parking system, nicknamed Ray, relies on a robotic car lift to pick your car up and deliver it to one of 249 reserved spaces. Ray can be accessed using a mobile phone app and tracks your flight’s progress, making sure your vehicle is ready for you when you return. Because the entire system is automated, it allows more vehicles to be parked in less space than traditional lots. And because Ray operates via battery, parent company Serva Transport Systems says it reduces carbon dioxide emissions as well. The machine can park vehicles up to 3.31 tons. Prices start at 4 euros per hour – about $5.50 – and cap at the equivalent of about $40 per day. Want to see the new robot valet in action? Ray is currently operational in Düsseldorf. If you can’t make the trip to Germany, take a look at the video below. It’s narrated in German, but still perfectly showcases the hyperfuturistic-looking tech. This is both awesome and extremely smart. I wonder how widespread it will be used.